At Grand River Inflatables & Party Rentals, we go out of our way to find you the perfect Bouncy Castle at the lowest price. With over 15,000 events in 13 years of business, we promise to beat any written or advertised price, so why go anywhere else? We bring you the most innovative, clean and newest units in the industry, top notch customer service, and we put the safety of your children first! We are large enough to handle any event and locally owned and operated! 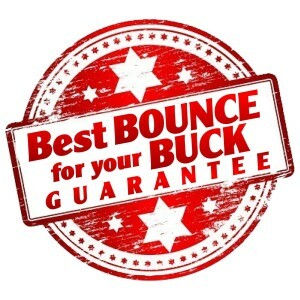 We guarantee you the Best Bounce for your Buck! What makes our business more attractive than our competitors? First of all, we pick up the phone when you call and return emails almost instantly. We maintain consistent quality with friendly, reliable service. Whatever your personal vision or needs may be, our professional team is here to ensure that you receive prompt delivery, clean, quality units with top notch service and clean cut, uniformed & trained TSSA staff. Maintaining a lifelong relationship with our customers is our number one priority, we want to personally guarantee your 100% Customer Satisfaction. Our staff of “Party Rental” experts know our products inside and out, and are very creative when it comes to great ideas to help make your event a smashing success! we invite you to meet our team!